It is with great shame that I fess up to being a bad sister/bad auntie/ad hoc crafter. The ad hoc revelation thing will not prompt shocked, the world-is-ending, bewilderment. With all the recent inlaw catering, my sister has patiently awaited the presentation of casseroles or lasagnes or some such homecooked goodness. Meanwhile her newest addition to the family, remains entirely bereft of handknittedness. If I don’t deliver this affair now, the kid will be sweltering in forty degree summer. 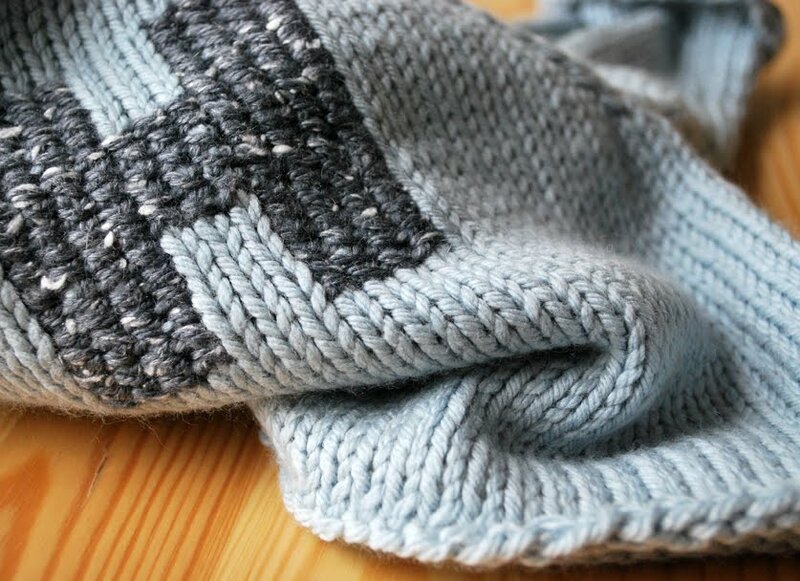 The pattern is from this book, knit with squidgy soft, Debbie Bliss Cashmerino Aran – only then with an on-a-whim, retrofitted, sort-of-cross-stitched ‘H’ (for baby ‘Hudson’). My thanks to Tam for the inspired kick to the (baby-gifting) shins. My thanks to Lauren for the nudge to the casserole guilt. 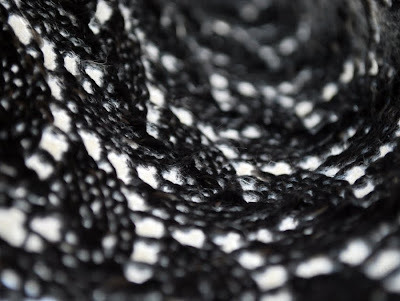 As I was ad hoc-ing the ‘H’ in place, using some stash yarn scraplet, I realised I had entirely neglected to blog my Ishbel experience. I’d hate you to think I never finish anything. You didn’t think that, did you? Entirely completed but with oh, so many mistakes, you can barely make out the intended pattern. Three quarters through, I realised all the horribly wrong. 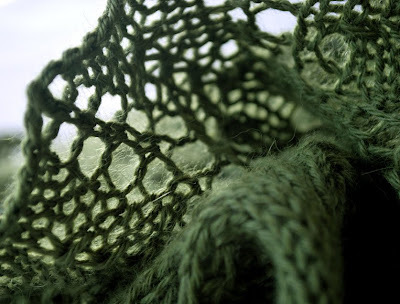 Yet I couldn’t stretch my knit wide enough on the needles to pick up my mistakes. 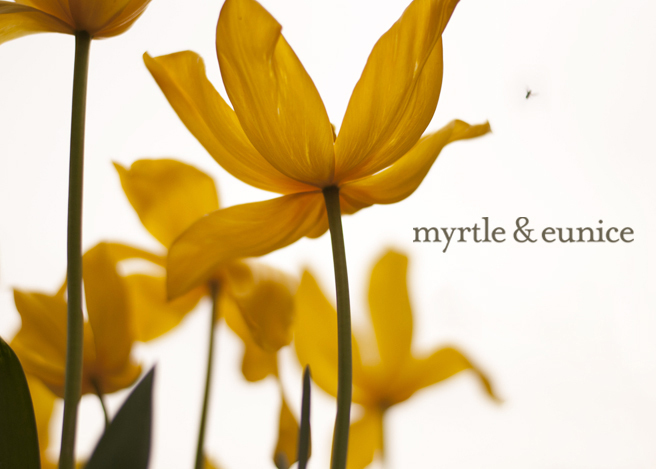 The biggest mistake was the blind assumption that I am a ‘reader’ of patterns. It turns out I am a Chart Reading Type. Turns out when I knit with a chart I can read the pattern. Amazing. In case you’re entirely in the dark about what an Ishbel should look like, due to my entirely unhelpful file photography, then go and see Suse. Suse knows how to show you an Ishbel. Not only that, Suse knows how to wear a shawl. That, I’m still working on. better late than never. She's you sister - surely she saw this coming? I think , as it is a customised gift, then it was worth the wait. Hudson won't mind I am sure. 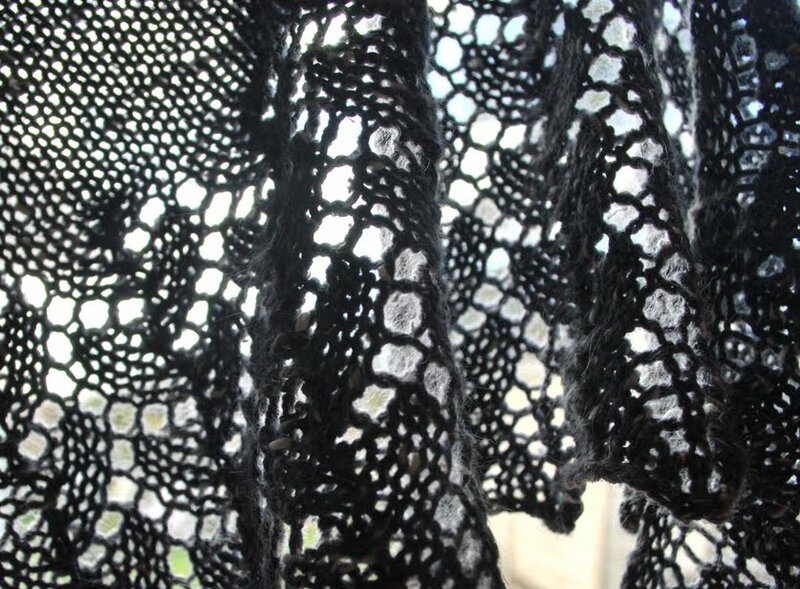 I am a Chart Reading Type also, and love Ishbel, although Ishbel II has been on the needles since January. 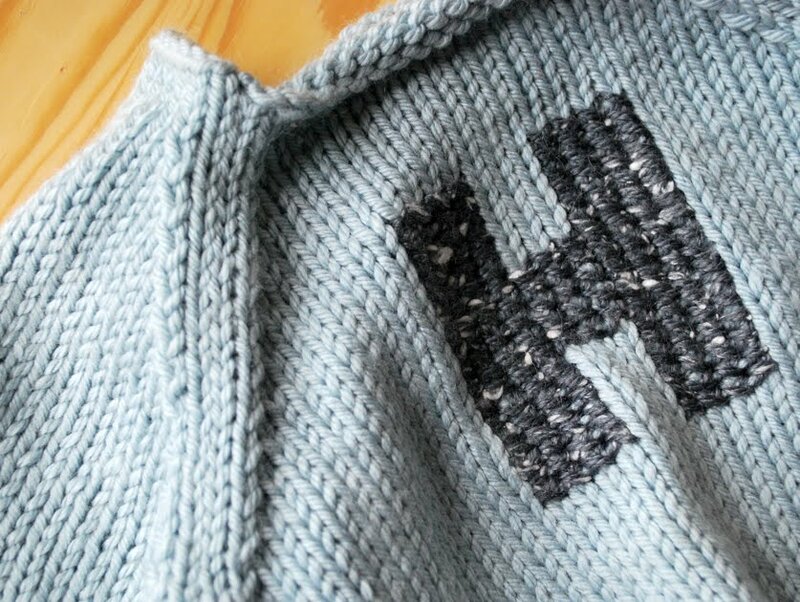 Oh such a cute sweater, love the "H" and your sister will be very pleased to receive a handmade pressie. Your Ishbel looks lovely, I had some trouble with mine when I hit the second lot of pattern. I prefer to read rows of pattern instead of charts but it is what I am used to. Love the jumper, presented before the 40 degree heat hit! Pray for colder days in the meantime! Super impressed by your Ishbel efforts, I took one look at the chart and ditched it! That's the cutest little jumper!! Ishbel is gorgeous too. I'm quite the opposite, I'm hopeless at reading charts but I probably haven't had enough practice either. Well you know what "they" say, good things come to those who wait. And in this case very, VERY good things come. The cross stitched H is a stroke of M&E brilliance. And the close up shots are all I need of the Ishbel to see it's loveliness - though that link to Suse was quite handy too! The jumper looks gorgeous. Soft and pretty. 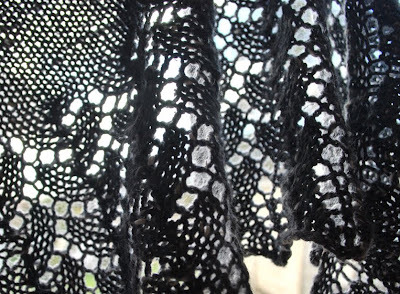 I've been doing a lace pattern knit and definitely made far fewer mistakes when I knitted it at home, preferably without any distracting television shows on or visitors. Aw, aren't you lovely?! Yes, charts taught me to be a real knitter and actually be able to 'read' my knitting. Prior to that with patterns, I just followed along blindly and then got terribly frustrated when things went awry. ...you can get knitting patterns with CHARTS??? I'm so there. I can only use crochet patterns with charts. Love ya work...and ya macro photography. The jumper is a winner. and surely sisters understand best the delays that houses chock full of visitors bring...if not I just blame the slow Tassie post - as I think I haven't made a b'day deadline in the last 4 years!!! your ishbel is lovely....i can't wait to see it on you!!!! and the little h in the sweater makes me so happy. i have no idea how that is done, but i am so into it. hope to learn that someday!! i just made my first hat ever!! coming along with the knitting skills. woohoo! we were just with our inlaws also! the kids are having grandparent withdrawal. not fun. not fun at all. i've been screaming and banging things trying to get them to wake up and smell the parental coffee, i mean parental authority. yep. It all looks like a miracle to me! Beautiful work. Well done - better late that never I say - I am often late with my gifts - but they always come with extra love. 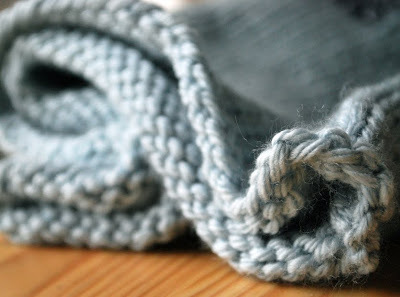 I am becoming a 'real' knitter at the moment in the form of reading a cable pattern chart - ahh - my eyes were cross eyed to start with and I now know what I am doing.